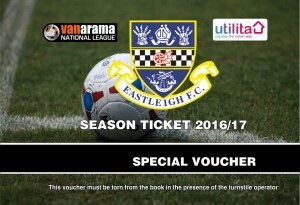 Don't forget all Eastleigh Football Club season ticket holders are entitled to bring a guest to the Vanarama National League home fixture against Guiseley, on Saturday 6th August 2016 on the opening day of the new season. To take full advantage of this fantastic offer, simply exchange ‘Special Voucher A’ from the back of your season ticket booklet in return for free entry to the game. Present your voucher at the turnstile to gain entry. For more information, please contact the club directly on 023 80613361. Manager Chris Todd shared his post-match reaction to the 4-1 win over Northampton. Goals: Eastleigh - Scott Wilson (22), Yemi Odubade (69). Goals: Banbury - Declan Benjamin og (20) Eastleigh - Yemi Odubade (22), Luke Coulson (57). Hamilton - Lewis Langridge (43, 82). Eastleigh - Scott Wilson (64). Eastleigh - Jake Howells (13), Andy Drury (55), Mikael Mandron (65). Weymouth - Chris Shepherd (9). Eastleigh - Luka Prelevic (3), Mikael Mandron (40), Yemi Odubade (45), Jack Smith (82), James Constable (86). Eastleigh - Scott Wilson (33), Mikael Mandron (35), James Constable (51, 53). Poole Town - Abdulai Baggie (40, 61). After a two-season absence, I have decided to revive and bring back the blog! So it hasn't really gone anywhere, in fact, those of you who know me personally are aware that I was the one to disappear - all the way to Asia to be in China with Johannah, who is now my wife. As I have embarked on this life-changing move to another continent, obviously it goes without saying that I couldn't be so close to Eastleigh Football Club anymore. That said, my passion for football, writing, blogging, journalism and love for the Spitfires is still strong and I want to continue the work that I started back in 2006 and get back in to it again.